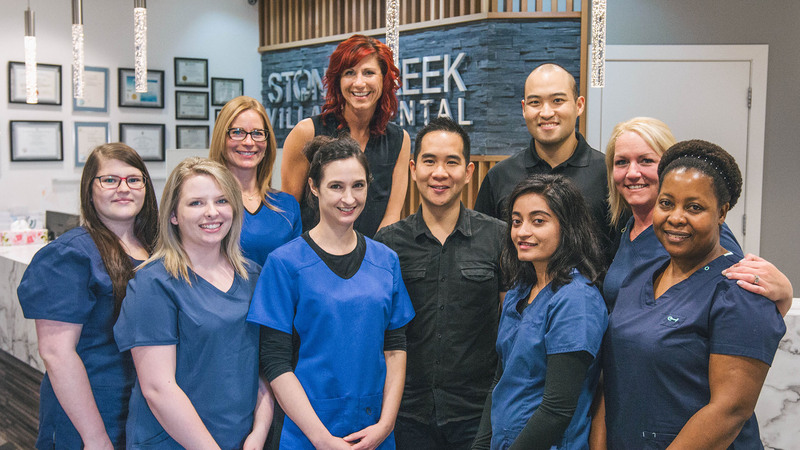 Stoneycreek Village Dental is one of Fort McMurray’s leading dental care facilities, with an extensive line of dental care services available. Dr. Alan Chan, Dr. Richard Jackson and their team of dental experts have serviced patients and families in the local Fort Mcmurray community and surrounding areas since opening in 2014. With the goal to offer the best dental care services and environment, Dr. Chan and Dr. Jackson designed a space that is both eco-friendly and technologically advanced. This focus has allowed their office to significantly reduce its tax on the environment by going fully digital (paperless), using digital x-rays (to eliminate film and avoid lead exposure), waterless dental suction units, ultrapure dental water, LED lighting, and heated hand dryers for your convenience. The office also boasts many amenities such as underground parking, wheelchair accessibility, direct insurance billing, convenient hours, online scheduling, wifi, leather sofas, televisions, refreshments and even a bouncy castle for children! Feel comfortable and at ease while our team focuses on your dental experience. If you’re looking for a new dentist, have a dental emergency or just have a simple question for us, our team is here to support you. Your smile is our top priority. Looking for a Fort McMurray dentist to support and resolve your current dental needs? Learn more about our highly-knowledgeable and dedicated team of dental experts. Receiving personal feedback is essential to our ongoing practices and care – your feedback is important to us! See what our happy and smiling patients have to say about us. Whether it’s a great limited-time special, something new in our dental facility, or even events happening locally, you can stay up-to-date by visiting our News & Events page. Conveniently located in central Fort McMurray above Save-On-Foods (with underground parking available), we are ready to assist your dental needs 7 days a week.